Effortlessly combining traditional styling with contemporary elements, this upscale 4 bedroom 2.5 bath single-story offers graceful living in a captivating canyon setting. 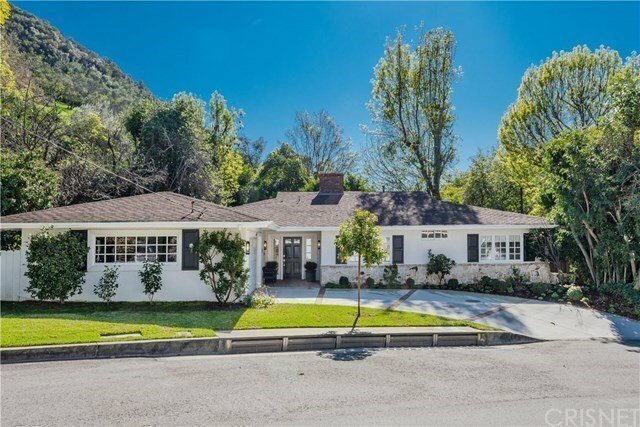 Located on a quiet cul-de-sac in prime Mandeville Canyon, this stunning home was recently remodeled with great attention to detail. An abundance of natural light floods the home through plentiful French doors which create an ideal indoor/outdoor entertainer’s flow. The open concept floor plan is enhanced by wood floors, designer fixtures, and clean lines creating a timeless atmosphere. Common rooms include a living room with vaulted beamed ceilings, and a raised hearth brick fireplace, a dining area with built-in bar and a gourmet center island kitchen with Carrara marble counter tops, beautiful breakfast banquette with under bench storage, custom cabinetry, a farmhouse sink, and top-line appliances that include Sub-Zero and Thermador. A spacious at home office offers the flexibility of being utilized as a 4th bedroom, while two generously sized secondary bedrooms complement the inviting master suite and its spa quality bath with furniture grade cabinetry, dual sinks, soaking tub and rain head shower. The lush well-manicured grounds have a large grassy yard, mature landscaping, canyon views and a large paver patio. Other amenities include a large laundry area , attached 2 car garage, powder room, and numerous furniture grade built-ins throughout. This enchanting , turnkey home is not to be missed!! !